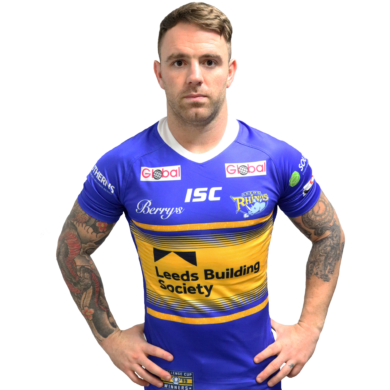 Richie joined the Rhinos ahead of the 2018 season from Catalans Dragons on a three-year contract and he made his first appearance in blue and amber in the Festive Challenge fixture against Wakefield. He was an almost ever present in his debut season and was named the Rhinos Player of the Year. He was a star for Salford during their promotion winning campaign and was named as the Co-Operative Player of the Year. In 2009 he made his Super League debut against Celtic Crusaders and scored a try to help them secure victory. He registered a further 12 tries that year and made the most try assists for the team. Ahead of the 2010 season he signed a four-year contract with Warrington to become the most expensive teenage signing in Rugby League history. He had a successful first season at Warrington, making 22 appearances, but missed out on selection for that year’s Challenge Cup Final after picking up a knee injury in the fifth round of the competition. In his second season at Warrington he once again featured regularly, despite fracturing his cheekbone in a 60-0 victory over his former club Salford and helped the team win the League Leaders Shield. 2012 saw Richie pick up his second piece of silverware as part of the side who beat the Rhinos 35-18 in the Challenge Cup Final and the following year he played 24 times for Warrington and appeared in his first Grand Final against Wigan, where they lost 30-16. The following two seasons Richie notched up 20 tries in 43 appearances but announced he would be leaving the club at the end of the 2015 season to join Catalans Dragons He made his debut for the Dragons on the opening day of the 2016 season against Wigan and made a further 18 appearances as he helped the team to finish in the top eight His final season at the Dragons was a tough year as the team battled relegation, but secured their place back in Super League with a 26-10 win over Leigh Centurions in the Million Pound Game. As a young player he represented both the Lancashire and England Under-17s at Academy Level and he made his debut for England in 2008 in a 74-0 win over Wales at the Keepmoat Stadium. In 2009 he was selected to represent England against France and started the game at scrum half and scored 30 points in the 66-12 England victory and three years later he represented England Knights where he put in two man of the match performances against Cumbria and France. He featured for England in the 2012 Autumn international wins against Wales and France, playing alongside current team mates Kallum Watkins, Ryan Hall, Jamie Jones-Buchanan and Carl Ablett. Away from rugby, Richie is an Ambassador for Leeds Rhinos Foundation’s Active Beyond Cancer programme. With almost 20 years experience, SM UK is one of the country's leading auto electrical installation companies. By providing full project management and bespoke solutions, we have already helped some of Britain's biggest vehicle and logistic operators such as BOC, LSS Waste Management, Aggregate Industries, as well as Scania, DAF and Volvo Trucks.